Greek artists frequently used the clothing worn by their subjects to distinguish ethnicity especially 'Persians' i.e. Aryans from Greeks (see Troy & the Amazon Queen Penthesileia below). This trait extended to Roman artists as well - perhaps via Greece's occupation and settlements in Italy. For instance, the clothing worn by the Magi as depicted by Roman artists is quite similar to the clothing worn by the Amazons in several depictions. These include elaborately patterned leggings, tunics and so-called (incorrectly) "Phrygian caps" - a cap style widely used by the Magi all over Aryana including Bactria. This fashion of clothing was also applied to Roman depictions of Mithra and is commonly called "Persian clothing" by modern authors - though it should correctly be called "Aryan clothing", Aryan being the name from which "Iranian" evolved. The artists' depictions are not entirely consistent, sometimes missing one piece or the other or all. Ranghaya, the upper Tigris-Euphrates Aryan lands is the sixteenth and last (Aryan) nation listed in the Zoroastrian scriptures, the Avesta. Persia and Media are not mentioned in the list of sixteen nations and were thus likely formed after the Avestan canon had been closed. While Persia would go on to become the center of Zoroastrianism until the Arab invasion, the historic Kurdish lands may have a better claim to antiquity in an expanding Aryana (and Zoroastrian heritage). Map of Asia Minor/Anatolia. Base map courtesy Wikipedia. Federal control over frontier Aryan lands varied depended on the power asserted by the dominant Aryan nation at a particular phase in history. When the Persian Achaemenids held power, at one time they asserted control over all Anatolian lands that were once a part of an Aryan kingdom such as the lands of the Hittites that included what became Lydian, Carian and Trojan lands. 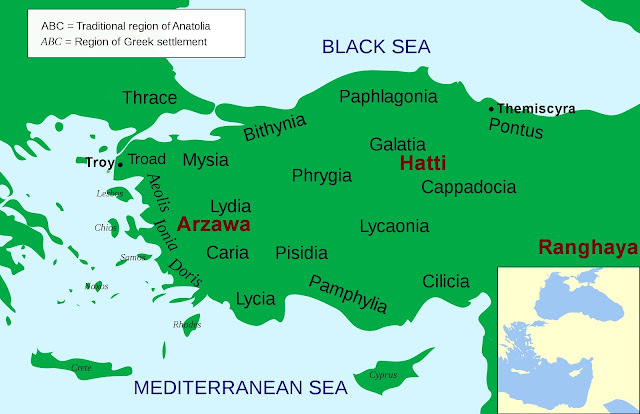 The extent of Aryan lands in Anatolia approximates the present division of lands between Turkey and Greece. When the Medes (Mada) became an Aryan-Zoroastrian nation, they soon asserted their dominance over all the Aryan nations (including the fledgling Persia - the Aryan tradition of a Aryan confederation with a king-of-kings at its head is ancient). Herodotus informs us that a conflict developed between the Medes and the western Lydians. According to Herodotus (at Histories 1.73), the conflict was over the Lydians giving refuge to a group of renegade 'Scythians' (likely Saka who the Greeks frequently confused with the European Scythians). Now, Lydia was the successor state to the Aryan Hittite (later the Persian satrapy of Katpatuka/ Cappadocia) sub-kingdom of Arzawa which encompassed the lands that became Lydia, Caria and Troy (on the north-western Anatolian coast on the Aegean Sea). 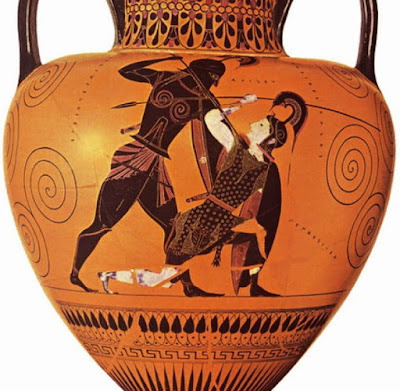 We will get to the story of the Amazons, Troy, Greece and the Persian wars shortly. First, after engaging in a battle that came to a stalemate, the Lydians and Medes established a treaty making their border the River Halys (Kizilirmak today) in central Anatolia (Herodotus' Histories 1.73-74). To cement the treaty, the Lydian king Alyattes gave in marriage his daughter Aryenis (Ἀρύηνιν/Aryinin) to the Median king Cyaxares' son Astyages. If there is ever an Aryan sounding name, it would be Aryin. When the Persian Achaemenid King Cyrus deposed the Medians as the dominant Aryan nation, the Lydian king Croesus took umbrage and attacked Cappadocia in retaliation. Cyrus responded and defeated Croesus compelling Lydia and its own vassal kingdoms (including perhaps Troy) to accept the Persians as overlords. Once the family spat and who was top dog had been resolved, Cyrus kept Croesus on as an advisor and confidant. We can now resume our story about Troy and the Amazons. The Greek invasion of Troy (c. 1200 BCE) was a pivotal event in Greek history - and in the history of Greek-Persian (i.e. Aryan) relations as well. So much so, that Herodotus starts his Histories by stating that the battle of Troy was the beginning of the wars between the Greeks and the Persians - i.e., Aryans, since Persia did not exist as a country at that time. Why the wars? Because the 'Persians', i.e. Aryans, thought of Troy and all of Anatolia as part of their sovereign territory. And who do you think came to help the Trojans defend themselves against the invading Greeks? None other than the Amazons led by their queen Penthesileia. Penthesileia died in combat with the Greek hero, Achilles (who in typical Greek fashion, fell in love with her after he had killed her). And there we have it. The rest as they say is history. Since then, Greeks and 'Persians' (Persians=Aryans and Amazons) began sticking spears and other pointed objects into one-another.